Back in July, when the Yankees acquired Zach Britton a few days before the trade deadline, it felt like a luxury. The Yankees already had a strong bullpen that rated statistically as one of the best in baseball, and using prospect capital on another reliever seemed questionable with the rotation and some other roster problems still in need of a solution. Since being acquired, however, Britton has quickly emerged as an indispensable part of the bullpen. He helped cover while Aroldis Chapman was on the disabled list — Chapman’s knee had been barking all season and I have zero doubt that factored into the team’s decision to add Britton — and also provides an extra layer of depth down the stretch and into the postseason. 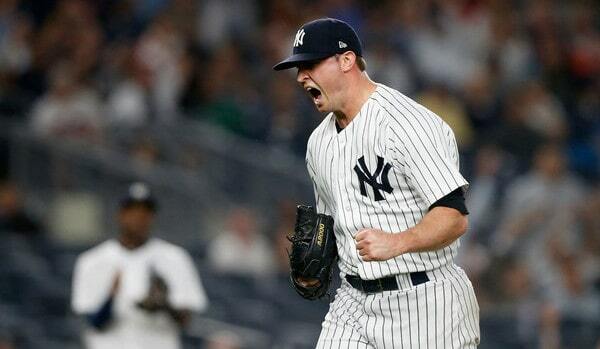 Britton has a 3.00 ERA (3.49 FIP) with an insane 77.9% ground ball rate in 24 innings with the Yankees. His first few weeks were a bit of a slog — not surprisingly, he’s been better as he gets further away from the Achilles injury — but he’s been especially good of late, allowing only three runs (two earned) in his last 16 appearances and 16.2 innings. Opponents have hit .155/.180/.207 against him in those 16 appearances. Britton’s been awesome. Does a reunion make sense? Two things to keep in mind here. 1. The Yankees will have to reinforce the bullpen this offseason. Britton and David Robertson will be free agents this winter and those are two key late-inning arms. The Yankees will still have Chapman in the ninth inning with Dellin Betances, Chad Green, and Jonathan Holder for setup duty, but yeah, losing two late-inning relievers to free agency is rough. The Yankees clearly place a premium on a deep bullpen and I can’t imagine they’d simply let those two guys walk and plug the bullpen openings internally (Domingo German? Jonathan Loaisiga?). That doesn’t necessarily mean the Yankees will re-sign Britton and/or Robertson, of course. The Yankees could go in another direction and sign Craig Kimbrel or Adam Ottavino or Jeurys Familia. Or they could trade for a bullpen guy. Who knows? There will be options. Point is, the Yankees will add to their bullpen this offseason. It could make sense to stick with a known commodity like Britton (or Robertson), someone the Yankees know and have a history with, but this is the same team that let Robertson walk so they could sign Andrew Miller. There will be a significant move(s) to reinforce the bullpen this winter. Bringing back Britton could very well be it. 2. Britton won’t come cheap. Nor should he. He’s very good, he’s left-handed, he has a super-elite skill (generating grounders), he’ll turn only 31 in December, and he’s shown in his brief time with the Yankees that he can be flexible. Britton’s entered games in the seventh, eighth, and ninth innings these last few weeks. The injury history is undoubtedly a red flag. Everything else? It’s all pretty good. That sounds like posturing more than anything. Good luck finding a team — or even an anonymous source connected to a team — saying they’ll pay top dollar to retain a player at this time of year. Even if they’re willing to do it, they won’t say it. It hurts their negotiating leverage. I’d have been more surprised if we didn’t hear something like this. Anyway, the Yankees are resetting their luxury tax rate this season and while I want to believe that means an increase in payroll is coming, I’m going to have to see it to believe it. The Yankees have the money to retain Britton, obviously. It’s just a question of whether they want to spent it, or if they want to find a cheaper alternative. If he wants $17M+ a year, walking away from Britton wouldn’t be too difficult, I don’t think. In terms of performance, I’m not worried about Britton going forward. His injury history scares me more than anything. And it’s not the Achilles. It’s the forearm trouble that sent him to the disabled list on two occasions last year. Those usually point to arm (specifically elbow) problems. To be fair, Britton hasn’t had any forearm woes since last year. That’s my worry though. Not the performance, the health. To me, I think keeping Robertson is essential this winter. He is three years older than Britton, but I expect that to be reflected in his contract, and I greatly prefer Robertson’s strikeouts to Britton’s grounders. Robertson’s injury history is cleaner as well. They’re both excellent and I’d be happy with either guy. My personal preference is Robertson. Britton would work just as well. Maybe the Yankees will re-sign both and make life easy. I’m not sure that’ll happen though. The Yankees and Britton have to get through the regular season and postseason before worrying about free agency. There is a time and a place to think about that stuff and that time’s not now. The Yankees figure to seek out bullpen help over the winter and Britton will be among the best available relievers. A reunion makes sense at the right price. With any luck, Britton will make it tough for the Yankees to walk away with his performance.